We hear a lot about how fast a car travels, but most of us rarely consider how fast the piston travels. This is basically a math problem. The effect of the connecting rod is a significant factor that is often under appreciated. I wrote the first version of this page in 2003. I received many complements and criticisms. In this rework of the page, I will try to clarify some of these concepts. 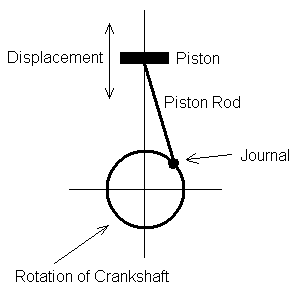 I first represent the rotation of the crankshaft as a circle where the center of the circle would be the axis of the crankshaft and the circumference represents the rotation of the center of the journal. The piston rod is then represented as a straight line. Since the piston and the top of the piston rod travel the same vertical velocity, the piston itself is not a factor. Figure 1 shows this representation. Next, I derived an equation to calculate the location of the piston. I ignore the piston itself and analyze the speed of the point where the piston and connecting rod meet. This point travels the same distance and speed as the piston. 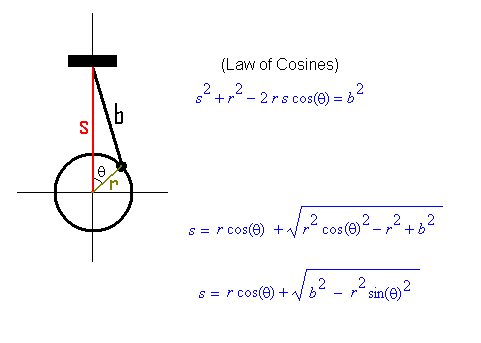 This relationship was straight forward by using the Law of Cosines. Then I solved for location using the quadratic formula. 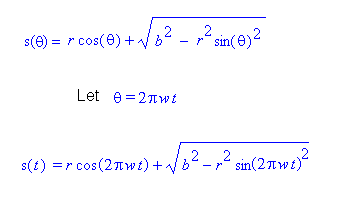 The result can then be simplified by a little Trigonometry. From this data we can establish the relationship between revolutions per second and radians per second. Making a leap forward, we can calculate the number of radians traveled by the crankshaft by multiplying the ω * 2 π radians/second by the number of second. 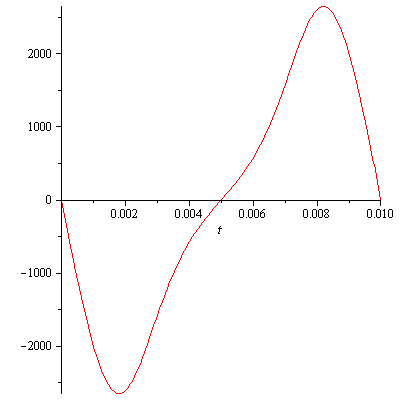 Thus we have, θ(t) =2πωt. By substituting this function as our angle in the displacement equation, s(θ), we then have the displacement as a function of time. This is probably also a good time to reveal one of my biggest assumptions. I assume that the rotational speed of the crank is constant when the engine is held at a constant RPM. Let's assume the car is in gear and moving at a constant speed. Each piston is connected to the crankshaft. The crankshaft is connected to the flywheel. Then we have the transmission, differential unit and wheels. If the rotational speed of the crankshaft changed as a result of each piston firing, the vehicle would jerk on each down stroke. All the connections from the flywheel to the car itself would dampen the effect of combustion. The next step is to take the first and second derivative of the location equation to obtain an equation for velocity and acceleration respectively. The derivatives of the displacement equation were derived using a wonderful program called maple. 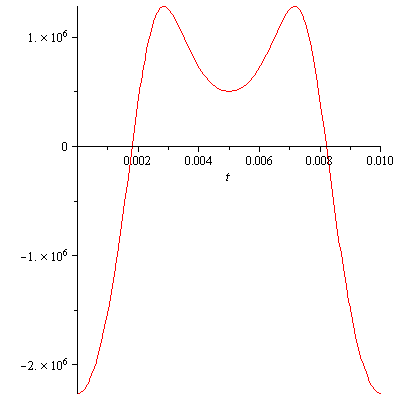 The graphs and equations shown here are derived from images produced with maple. Now let's use some numbers for these equations and generate some graphs. I am going to use the radius of 3.5 inches and the piston rod length of 5.5 inches. The engine will operate at 6000 RPM. These are fictitious values; however, they demonstrate an interesting aspect of the equations. Given that the revolutions per minute are 6000, then the duration of one revolution is 1/6000th of a minute. 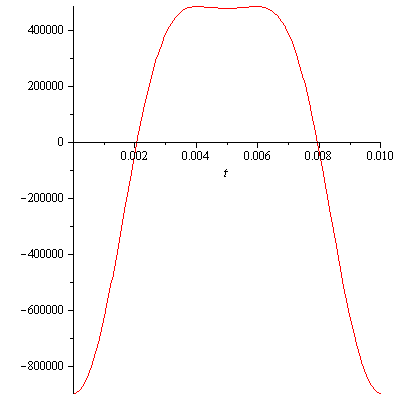 This implies that one period of the displacement graph is between t=0 and t=1/6000 minutes. Let's convert t=1/6000 minutes to seconds: t = (1/6000)*60 = 0.01 seconds. So our time interval is from t=0 to t=0.01 seconds. Let's also convert Revolutions per Minute to Revolutions per Second: 6000 Revolutions/Minute = 6000/60 Revolutions/Second. So 6000 RPM = 100 RPS. Given that the revolutions per minute are 6000, then the duration of Graph 1 is our location equation, s(t). The velocity graph is a little more interesting. I would have expected more symmetry in this graph. The graph of the velocity as the piston travels up is not symmetrical to the graph of velocity as the piston travels down. We will come back to the maximum velocity after the acceleration graph is examined. The acceleration graph is by far the most interesting. I thought this was going to be some simple problem with just some simple sin wave. But, this graph shows that there is nothing simple about the piston's motion. 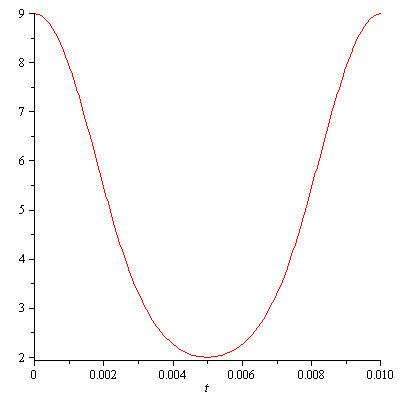 From Calculus we know that the maximum and minimum velocity occur when the acceleration is zero. The acceleration graph crosses the x-axis at t=0.001799756496 seconds and t=0.008200243504 seconds. This number doesn't mean much to me, so let's convert this to miles per hour. The astonishing part is that the piston goes from 0 to 151 MPH in 0.0018 seconds! What is the location of the piston and angle of the crankshaft? I was also curious at the location the piston when at it's maximum speed. We can evaluate the location equation for t=0.0018 seconds. This means that the piston came from 9 inches down to 5.99 to reach its maximum velocity. The angle of the crankshaft is found by converting 2πωt to degrees. Notice that this speed is not attained at 90°. 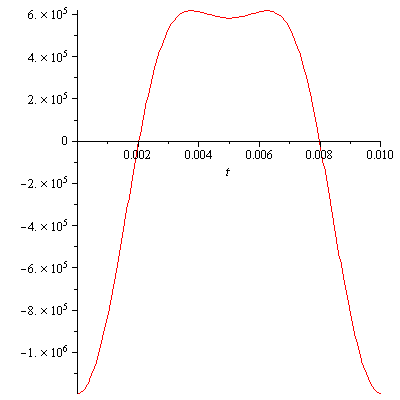 The dimensions in the above example are not realistic, but that example clear shows the character possible in the acceleration curve. Here are some realistic examples and the graph of their acceleration. |v(0.00206)| = 1143 inches/second = 65 MPH. 0 to 65 in 0.00206 seconds! |v(0.00202)| = 1496 inches/second = 85 MPH. |v(0.0021)| = 1078 inches/second = 61 MPH.